A lot of people feel a certain unease about analytics, including the EEA’s Social Media Editor Paul Hebert, who is an active blogger on human resources and Principle of his own consulting firm. In a recent blog post, Why I don’t Really Like the Whole Analytics and Big Data Thing in HR, he raises some legitimate issues that should concern everyone related to the misuse of data, including in ways that end up actually hurting people. While it’s impossible to disagree with this overall concern, I believe the growth of analytics is a boon to the Enterprise Engagement movement, because properly applied analytics will reveal facts, and we are confident in the research demonstrating that organizations sincere about achieving results through engagement and that connect all of the dots will see clear benefits, and those that don’t will experience problems that smart analytics will identify. 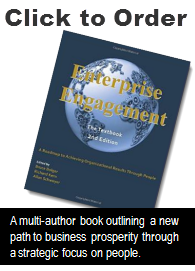 The work of London Business School professor Alex Edmans on the impact of engagement on stock market prices, as well as the EEA’s own Engaged Company Stock Index, show the possibilities, but they don’t provide granular information organizations can use to transform a premise into a measurable business strategy. Analytics will be critical to help organizations better understand the hidden costs of doing things they firmly believe save money, such as having automated operators for customer service; reducing pay, incentives or recognition; skimping on training and professional development; etc. For more information on analytics, see this recent feature on analytics on the ESM portal. You can also learn more about analytics at Engagement University, April 25-28, 2016 in Orlando, and meet with leading suppliers of analytics services.